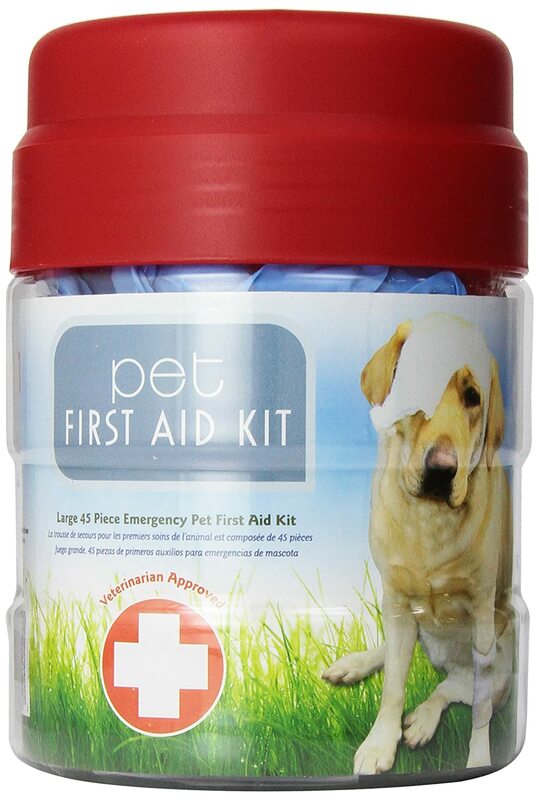 Lixit First Aid Kit for Dogs and Pets contains everything you need for pet emergencies. Container lid doubles as a water bowl. Kit has 45 items from bandages to scissors. All items can also be used for human emergencies. Veterinarian approved. Contains: Adhesive 1 Tape Roll (1) Sting Relief (3) Cold Pack (1) Cotton Tip Applicators (5) Alcohol Prep Pads (3) Finger Splints (2) 8" Gauze Pad (1) 4" Gauze Pads (2) Gauze Roll (1) Antiseptec Towlette (3) Antibiotic Ointment (3) Thermal Blanket (1) Examination Gloves (2) Hydrocortisone (3) Splinter Remover (5) Povidone Iodine Pad (3) Scissors (1) Tweezers (1) Triangular Bandage (1) 10ml Syringe (1) First Aid Guide (1)."